﻿ Why is Platinum A Good Metal for Jewelry? Although we’re used to gold and silver as the structure in our jewelry, we often forget that platinum is also a great metal used in jewelry. If you’re a little confused about exactly what platinum is, it would be good to think of platinum as a cross between gold and silver, an element that looks a lot like silver but has prices set in the range of gold. Platinum is an extremely rare metal, but has been found to be just as viable in jewelry as gold and silver. So why is platinum such a good metal for jewelry? And why isn’t it used more often? This article will examine these questions and hold up a microscope to that rare, durable, and intriguing metal that some people value over even gold. What makes any metal good for jewelry? First, we’ll have to ask ourselves what would make a metal suitable for jewelry. Metals that go into jewelry tend to have two requirements: durability and extravagance. You can’t have a metal with just one of the two – imagine rings made out of nickel or copper, or bracelets made from aluminum. Not attractive. However, if you build a ring out of gold or silver, suddenly you’re talking. Jewelry isn’t only meant to be worn, it’s meant to be flaunted. Platinum fills both of these requirements, as an extremely corrosion-resistant, heat-resistant metal that has the glimmer of a metal worth over $800 per troy ounce. Needless to say, this makes platinum as ideal for gold and silver for watches, bracelets, necklaces, and rings. This does, however, lead to another question: if platinum is such a great metal for jewelry, why isn’t it as commonly used as gold? Where is all the platinum jewelry? Walk in any jewelry store this holiday season and you won’t be surprised to see dozens of little articles made from that familiar substance: golden earrings, golden necklaces, golden rings. Diamonds set in gold, pearls set in gold, and even gold watches. Gold is a relatively rare material; why is it so frequent while platinum is not? For one, the demand for gold jewelry is high, but another factor should be considered: platinum is about 30 times rarer than gold, which is itself already much rarer than another precious metal, silver. The amount of places on Earth that successfully mine platinum is extremely limited, and as such, you simply won’t see as many platinum articles of jewelry. Another question many might have at this point relates to the worth of platinum – though it is generally higher than gold, it is not much higher, typically hovering just above gold, while both gold and platinum hover high above silver. 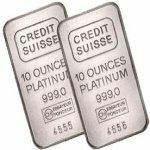 If platinum is thirty times rarer than gold, why isn’t it thirty times as valuable? According to the law of supply and demand, supply itself isn’t enough to drive up the value on one commodity. The demand has to be high as well – and the demand for platinum simply isn’t as high as gold. Remember the jewelry store you walked into a few paragraphs ago: it was full of gold not only because gold is more plentiful, but because more people simply want gold. This doesn’t make platinum a poor metal for jewelry; in fact, we have already detailed why it is much more than that. Now it’s time to look at platinum in a different light and perhaps better understand why it is not the most popular precious metal to use, despite its high value. Platinum is a good metal for jewelry, but it is not the ideal commodity, simply because it is so rare and difficult to acquire. Silver and gold are both put into jewelry; silver isn’t ideal because it is common enough to be much cheaper. Gold is closer to ideal because it is both expensive and relatively easy to acquire. Though all of the precious metals mentioned here make great options for jewelry (and you probably won’t have any trouble digging up some platinum jewelry to buy), there is a reason that platinum the commodity simply doesn’t function as well as gold for the sake of jewelry. Remember the two criteria for jewelry metals mentioned earlier in this article and you’ll have a good grasp on what goes into a nice jewelry metal. Platinum meets both of those criteria with its durability, attractiveness, and innate worthy; while it is not as frequent as gold, it is certainly as legitimate a commodity. Continue to explore Sell Gold HQ for more on platinum as well as information on selling your platinum for a fair price.